Lucid words. But there’s one small problem. No matter how helpful these antagonists might be, they usually get treated like, well, antagonists. This is the paradox of dissent and Jeremy Mercer examines how a new generation of behavioral economics, neuroscientists, and business managers are attempting to extract the fruits of dissent while protecting the cherished dissenter from the claws of conventional thinkers. 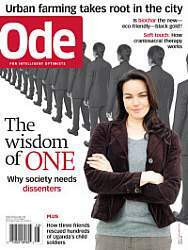 And, if you aren’t familiar with Ode Magazine, visit the site and give it a look. In an age where most magazines are dumbing down and featuring high-profile investigations on celebrity cellulite, Ode provides a progressive and in-depth look at everything from advances in green architecture to the future of ethical investment. Worth a look is Mercer’s earlier – and award-winning! – essay which examines how standard economic theory wrongly dismissed the role altruism plays in society and business.